A lot has happened in the music space recently that suggests a steady progression towards the sale of DRM-free music by the big labels. In my opinion this progression/evolution is inevitable, and will be followed by a reduction in pricing towards zero – services will be able to sell based on service levels (ease and speed of download, inclusion of music video content and album art, etc. ), but not much else. I’ll expand these thoughts in a post later this week. Today I came across a new startup called Amie Street that may have found the right way to help people discover and market price music from new or little known bands. 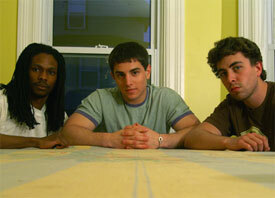 The founders, Elliott Breece, Elias Roman and Joshua Boltuch, are three Providence, RI college students (pictured left to right in photo below). This is a very alpha site and there are a few bugs (I can only get the flash player to work on Firefox on a PC, no luck with IE or Firefox on Mac), and the interface could use some help with flow. But the core business model is killer, something I haven’t seen before. Artists can upload their music to Amie Street for promotion and sale. Users form social networks with friends, listen to, and purchase music. All songs are DRM-free in MP3. Songs appear to be at 192kpbs quality level, although it may just be whatever the artist uploads. All songs are free to start. Prices fluctuate over time based on demand for the song – currently the highest priced song, “Against the Wall” by Danny Ross, is $0.36. 273 songs have been uploaded so far. This demand based pricing model seems like a good way to sell music. Users can search, browse and listen to music for free (via streaming). My download test worked well and the price of the song was properly deducted from the $3 in account credit I put on my credit card. Users who have purchased a song can recommend it to their friends using a limited number of “rec’s” that they receive (users get one per dollar they add to their account). Once recommended, users will get account credit if the price of the song increases, giving them an incentive to find and recommend good music. If you REC a song at 1 cent or above Amie Street will pay you half of the difference in the prices. So, if you REC a song at 10 cents, and it ends up at 90 cents, we will pay you 40 cents (half of the 80 cents difference). If you REC a song while it is still free (0 cents), and it ends up at 98 cents, we will deposit 98 cents into your Amie Account. Amie Street pays you more for RECing a song while it is still free because you take more of a risk and because we want everyone on Amie Street to be RECing those great undiscovered songs. Artists keep 70% of proceeds after $5 in sales. They are not required to sell their music exclusively through Amie Street, and can remove it at any time. The model is extremely well thought out. Since the vast majority of bands are not concerned with people stealing their music – they just want people to listen to it – Amie Street could be a great way for them to promote their stuff. Myspace has proven that social networks are a perfect mechanism for promoting music, and the tweaks Amie Street have put on the model could be a winner. This is one to keep an eye on as it prepares for a full public launch.